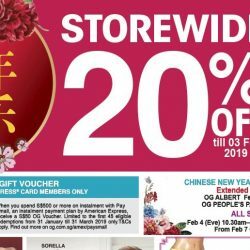 Till 3 Feb 2019 OG Singapore: CNY Sale with 20% OFF Most Brands’ Regular-Priced Items + E-Coupons for Special Deals! With Chinese New Year just 5 days away, you’d need to hurry to get all that you need for the celebrations! At OG, you can get everything new for the New Year and at a most timely 20% off most brands’ regular-priced items. Now till 3 Feb 2019. Plus! There are so many special deals that you shouldn’t miss and also flash below e-coupons to enjoy special deals! 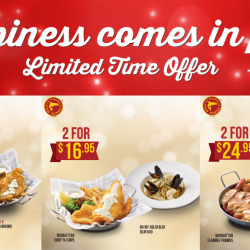 Till 31 Jan 2019 The Manhattan FISH MARKET: Flash These Coupons to Enjoy 1-for-1 Deals & Bundle Meals from only $9.90! Happiness comes in pairs! Swim by to your nearest Manhattan FISH MARKET with your best foodie mate and simply flash these coupons to enjoy exclusive 1 for 1 deal for a limited time only! 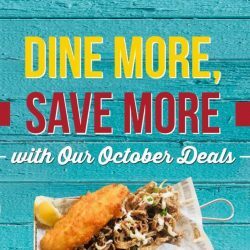 You can also complete your meal with your favourite choice of bundle from only $9.90! 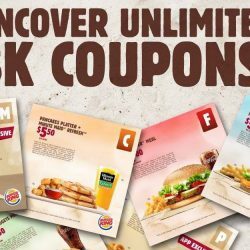 Till 1 Jan 2019 KFC: Pay $0.50 (UP $3.80) for 1 Pc of Goldspice Chicken with DBS/POSB Cards! KFC Goldspice Chicken makes a comeback this festive season. Order online or through the KFC App and have these delivered to you. This Christmas shall not be red, but gold! 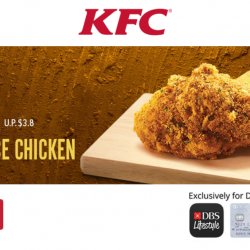 Pay only $0.50 (UP $3.80) for 1 pc of Goldspice Chicken with DBS/POSB Cardmembers! Valid till 1 January 2019, limited redemptions in store and KFC delivery. Min. 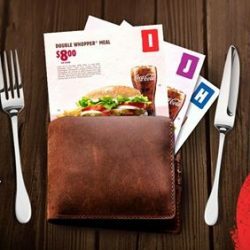 spend of $14, excluding $4 delivery charge for KFC Delivery. 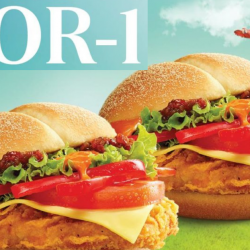 11 - 18 Nov 2018 McDonald’s: Flash Coupon to Get 1-for-1 Red Hot Spicy Peppers Burger! From 11-18 Nov, get a free Red Hot Spicy Peppers Burger when you grab the same burger ala carte or as an extra value meal! Simply flash this coupon from your phone or the cut-out from this Sunday's Sunday Times to redeem this exclusive one-for-one offer. Hurry down to McDonald's restaurants after breakfast hours! Deal's while stocks last. 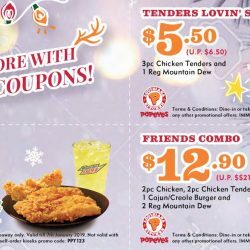 Till 26 Nov 2018 Popeyes: NEW Coupon Deals + Get 5pc Chicken for only $6.90 on Popeyes Day! 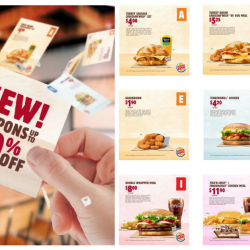 These coupons are reasons why you should head to Popeyes today! Psst, be sure to try their new Cereally Crispy Chicken too! Also don't miss out on your favourite offer! 5pc Chicken for only $6.90 (U.P. $13.90) will be available this coming Popeyes Day, 4th November. 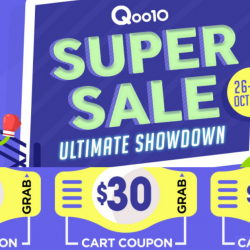 9 - 11 Oct 2018 Qoo10: 10.10 Ultimate Sale with Up to $100 Coupons Up for Grabs! Qoo10's 10.10 Ultimate Sale has started! Grab up to $100 coupons to save on your purchases! 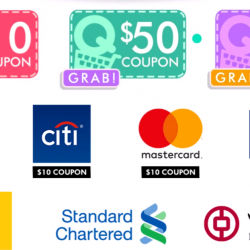 Including exclusive coupons for Citi , UOB, Maybank, Mastercard and more. Also check out the 10.10 flash sales with amazing deals on electronics, fashion, food, beauty and more products! Sale ends 11 Oct 2018. 24 - 30 Sep 2018 Mr Bean: Flash These E-Coupons to Save Up to $1 on their Riceballs! Enjoy all these beanie-licious deals at Mr Bean this September all at the tip of your hand! 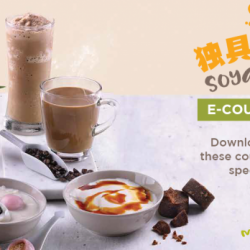 Simply download these coupons and flash it at any store to enjoy the special deals, EASY! Remember to stay tuned for more deals coming up every week in September! Who knew Popeyes' buttermilk biscuits could taste so savoury? Or cheesy? If you've yet to try their Cheesy BBQ Biscuit Burger, reach for the ⭐and grab the Popeyes Star Box now! 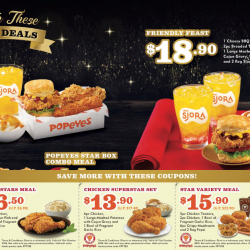 Catch the Star Deals from $8.90 to $18.90 plus also save more with coupons on other set meals! 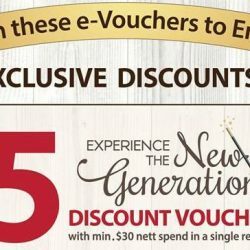 Till 11 Sep 2018 KFC: Save Up to $12 with These Latest E-Coupons! 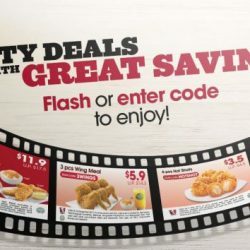 Enjoy great savings with these irresistible deals at KFC! Simply download and flash the e-coupons to redeem! Available for dine-in and takeaway only. T&Cs apply. 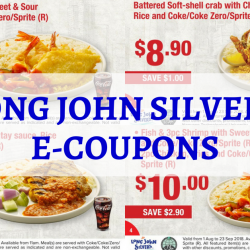 1 Aug - 23 Sep 2018 Long John Silver’s: Save Up to $3.20 with E-Coupons! 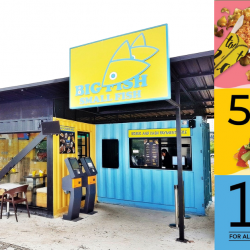 This National Day Long John Silver's is paying tribute to the local tastes of Singapore with 3 delightful dishes! ‘Ho-Jiak’ features Soft-shell Crab in their signature batter, drizzled with Chilli Crab sauce.‘Sedap’ will satisfy your satay cravings with Cajun Chicken and a rich peanut sauce, alongside diced cucumber and red onion. Else go for ‘Shiok’, Fish & 3pc Shrimp in a sauce perfectly balanced in sweetness and sourness. All dishes are served atop fragrant rice, with refreshing Coke/Coke Zero/Sprite. Till 23 Jul 2018 Popeyes: NEW K-POPeyes Wings & Fried Churro Fries + Save More with Coupon Deals! The Korean wave has hit Popeyes! 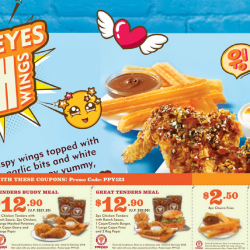 Try their new sticky-sweet, sesame and garlic coated K-POPeyes Wings and the crispy, fried Churro Fries today! 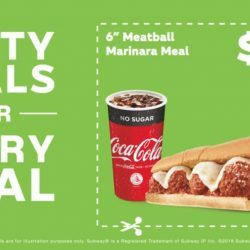 Enjoy poppin' great deals featuring these new items or make use of the coupons to save on set meals and value buys! For dine-in and takeaway. Valid till 23 July 2018. 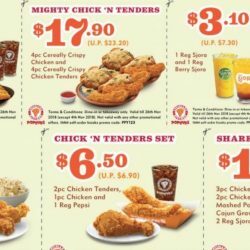 Till 11 Jun 2018 Popeyes: NEW Aloha Rendang Chicken + Save Up to $4.50 with Coupon Deals! 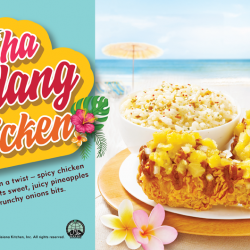 Try Popeyes' new Aloha Rendang Chicken - spicy chicken rendang meets sweet, juicy pineapples and crunchy onions bits! 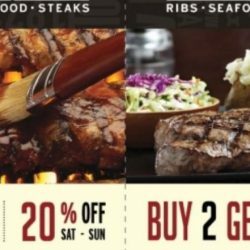 Tradition with a twist~ Also save up to $4.50 with their discount coupons, valid till 11 June 2018. First 1600 Customers! 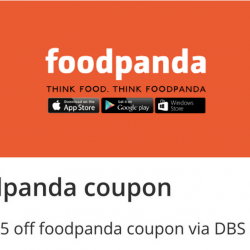 Foodpanda: Grab $5 OFF Coupon via DBS Lifestyle App! Grab your S$5 off foodpanda coupon via DBS Lifestyle App now! Applicable on selected merchants such as Manhattan Fish Market, Burger King, Jollibee, Nene Chicken and more. Valid till 31 May 2018. 600+ left for grabs at point of post, so hurry!